Each and every day it seems like there’s a news story that makes us scratch out heads wondering what people are thinking. Some people, out of some strange need, will go to extremes to get even with others. No matter how small or insignificant an event is to us, we never know exactly how others will react to it. Some will let it pass without a thought or care, others will feel the need to settle accounts, so to speak. With the release of the fourth book in my landmark science fiction series ‘Ghost Town’, this blog will explore one of the main driving forces in the series, revenge. Unleashing his weapon of war on the unsuspecting farming community of Whiterock South Dakota, Doctor Tesla showed the government, and many others, just how powerful his weapon was, and the fact that controlling the weapon was questionable at best. That didn’t stop Victor from unleashing his weapon and wiping the community out. Doctor Tesla felt that for what was done to him, all the people of the world needed to suffer and pay for supporting the governments that tried to take so much from him. With nothing as it seemed, an FBI agent tried to stop the madness of Doctor Victor Tesla but he didn’t uncover the truth until it was too late. Revenge can take many strange turns. Often when we talk about revenge we can look into our own lives and the world around us and think that justice should be done but the people who are causing problems are operating in such a gray area that often times the law is being bent but not broken or that it’s so ambiguous that police and the legal system don’t want to touch it. We see it around us all the time; the politician who promises great things but spends money on personal projects, the lawyer who sues for a laughable reason and shuts down a popular business, a school board president who forces a popular high school basketball coach to leave so he can put his friend in as coach who will play both of their incompetent daughters over better, more deserving players, a cheating husband, a bullying kid, or a crooked manager. Little things like that that go on every day that most people are upset over but let slide are the things that, with the wrong person, a person who won’t let it go, can cause them to seek out revenge in the worst way. This is what happed to Doctor Victor Tesla. He could no longer sit back and watch others try and destroy him. Tesla decided that there was no price to great, he would show the world fear. He would show the world suffering. Doctor Victor Tesla decided that he was going to destroy everything that others had tried to create. With the destruction of Whiterock in the first trilogy of the ‘Ghost Town’ series, called, ‘The Whiterock Incident’, Doctor Tesla showed that he wasn’t kidding around when he said he was getting revenge. With Whiterock still burning to the ground, Doctor Tesla decided to move to phase two of his revenge, ‘The Genesis Event’. Using the technology and weapons that he developed, Tesla has moved from the tiny farming town of Whiterock South Dakota to the major metropolitan area of Genesis Minnesota. With his team in place, and satellites and cameras watching all the action, Doctor Tesla instructed his finest people to infiltrate businesses and groups to monitor all the activity during the destruction phase of the ‘Genesis Event’. 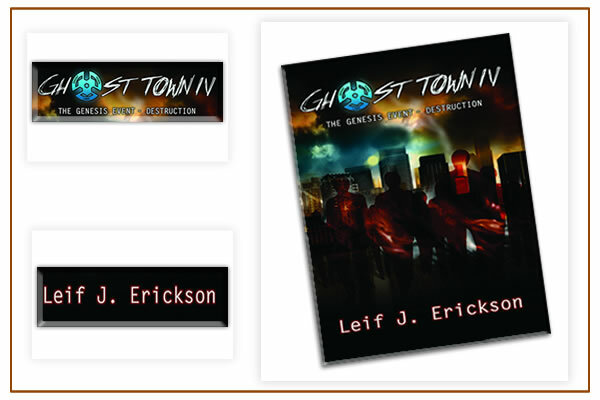 ‘Ghost Town IV, The Genesis Event – Destruction’ follows the groups of workers as they monitor the events as the metropolitan city of Genesis becomes the testing grounds for what is to become the darkest chapter in human history. A weapon so insidious, so evil that even the creator cannot control it. As the events unfold, many begin to wonder if there will be any way to stop Doctor Victor Tesla and his madness before they destroy everything. To extract his revenge, Doctor Tesla is willing and ready to let the world burn. Can he be stopped? 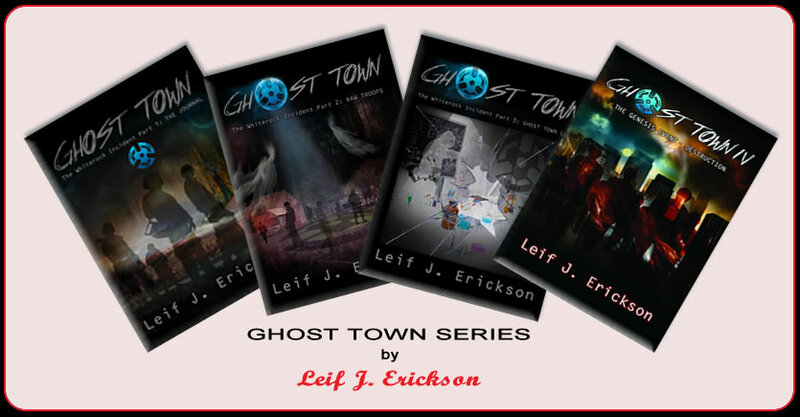 Head over to www.leifericksonwriting.com and pick up you copies of the ‘Ghost Town’ series today, including the newest release, ‘The Genesis Event – Destruction’. Thank you.